"He speaks to what is best inside us," Obama says at memorial service. 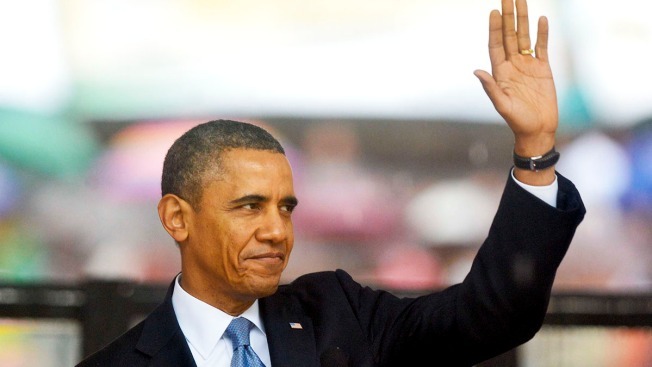 In a speech that received thunderous applause at FNB stadium and a standing ovation, Obama called on people to apply the lessons of Mandela, a "giant of history" who emerged from 27 years in prison under a racist regime, embraced his enemies when he finally walked to freedom and ushered in a new era of forgiveness and reconciliation in South Africa. He called Mandela "the last great liberator of the 20th century," comparing him to Abraham Lincoln, Mahatma Gandhi, and Martin Luther King, Jr.
"And while I will always fall short of Madiba's example, he makes me want to be a better man," Obama said of Mandela, who died Thursday at age 95. "He speaks to what is best inside us." Obama pointed out that "around the world today, men and women are still imprisoned for their political beliefs; and are still persecuted for what they look like, or how they worship, or who they love." Among the nearly 100 heads of state and government were some from countries like Cuba that don't hold fully democratic elections. On the way to the podium, Obama shook hands with Cuban President Raul Castro, underscoring a recent warming of relations between Cuba and the U.S. Former Presidents Jimmy Carter, Bill Clinton and George W. Bush also attended the ceremony. The weather and public transportation problems kept many people away. The 95,000-capacity stadium was only two-thirds full. Some of the dozens of trains reserved to ferry people to the stadium were delayed due to a power failure. 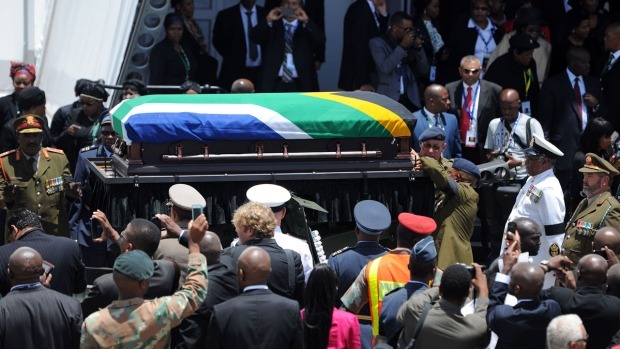 A Metrorail services spokeswoman, Lilian Mofokeng, said more than 30,000 mourners were successfully transported by train. The mood was celebratory. A dazzling mix of royalty, statesmen and celebrities was in attendance. Thabo Mbeki, the former South African president who succeeded Mandela, got a rousing cheer as he entered the stands. French President Francois Hollande and his predecessor and rival, Nicolas Sarkozy, arrived together. United Nations Secretary-General Ban Ki-moon waved and bowed to spectators who sang praise for Mandela, seen by many South Africans as the father of the nation. "I would not have the life I have today if it was not for him," said Matlhogonolo Mothoagae, a postgraduate marketing student who arrived hours before the stadium gates opened. "He was jailed so we could have our freedom." Rohan Laird, the 54-year-old CEO of a health insurance company, said in the stadium that he grew up during white rule in a "privileged position" as a white South African and that Mandela helped whites work through a burden of guilt. "His reconciliation allowed whites to be released themselves," Lair said. 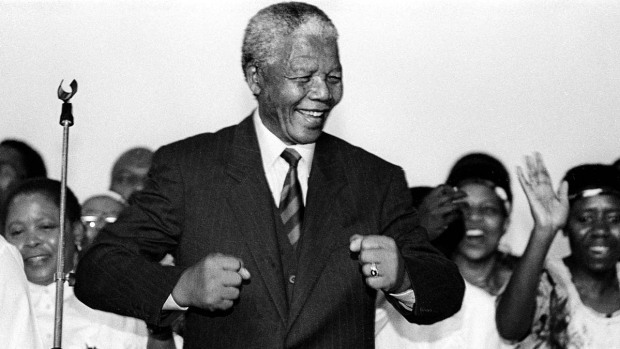 "I honestly don't think the world will see another leader like Nelson Mandela." Mandela's widow, Graca Machel, and former wife Winnie Madikizela-Mandela were at the stadium, and gave each other a long hug before the ceremonies began. So were actress Charlize Theron, model Naomi Campbell and singer Bono. Tuesday was the 20th anniversary of the day when Mandela and South Africa's last apartheid-era president, F.W. de Klerk, received the Nobel Peace Prize for their efforts to bring peace to their country. De Klerk, a political rival who became friends with Mandela, was also in the stadium. Mandela said in his Nobel acceptance speech at the time: "We live with the hope that as she battles to remake herself, South Africa will be like a microcosm of the new world that is striving to be born." The sounds of horns and cheering filled the stadium. The rain, seen as a blessing among South Africa's majority black population, enthused the crowd. "In our culture the rain is a blessing," said Harry Tshabalala, a driver for the justice ministry. "Only great, great people are memorialized with it. Rain is life. This is perfect weather for us on this occasion." UpdatedMandela Funeral Date Set as World Mourns "Icon"
Police promised tight security, locking down roads kilometers (miles) around the stadium. However, the first crowds entered the stadium without being searched. John Allen, a 48-year-old pastor from the U.S. state of Arkansas, said he once met Mandela at a shopping center in South Africa with his sons. "He joked with my youngest and asked if he had voted for Bill Clinton," Allen said. "He just zeroed in on my 8-year-old for the three to five minutes we talked."